UDM Downloads > Document Printer Pro (docPrint Pro)! 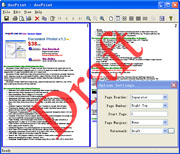 docPrint Document Converter Professional is a software product that dynamically converts MS Office 97/2000/XP/2003, WordPerfect, HTML, AutoCAD DWG, PostScript, EPS, PDF, MS Visio and many other document types to PDF, PostScript, EPS, JPEG, TIFF, PNG, PCX and BMP etc formats. It works in both GUI version and Command Line version. With docPrint Document Converter Professional you can convert your documents from and to PDF, EPS, PS, JPEG, TIFF, BMP, PCX, PNG files easily. docPrint Document Converter Professional Batch Conversion Formats: Input formats: DOC, HTML, Web Pages, RTF, TXT, XLS, PPT, VSD, PDF, PS, EPS as well as any other printable documents; Output formats: PDF, PS, EPS, JPEG, TIFF, BMP, PCX, PNG Document Converter Professional (docPrint Pro) Features: docPrint Document Converter Professional program provides a regular console interface and GUI interface to batch convert document files, it includes all of the features in docPrint plus: 1. docPrint Document Converter Professional includes all of the features in docPrint; 2. Create PDF, PS, EPS and image files from any Windows application that supports printing; 3. Convert Microsoft Word, HTML, Web Pages, RTF, Text, Excel, PowerPoint, Visio, AutoCAD drawings, Adobe PDF, PS, EPS, e-mail etc. files to PDF, Postscript (PS), EPS JPEG, TIFF, BMP, PCX, PNG files; 4. Save web pages in PDF format for future references; 5. Font embedding, resolution and image compression support; 6. Supports user defined page sizes; 7. Works as Windows Standard Printer, accept settings from DEVMODE structure; 8. Auto open PDF file after creation; 9. Support Asian language characters; 10. Multi-language support; 11. Live hyperlink support; 12. Native support for 500+ Windows applications; 13. Free upgrades in the future for registered users; 14. Does NOT need Adobe Acrobat software; 15. Create XPS, PCL, WMF, EMF, PDF, PS, EPS files.